St. Eligius's most critical patient lends a sympathetic ear to a depressed Victor Ehrlich. of wisdom to her four-eyed doctor. In her first three appearances, Mrs. Hufnagel (Florence Halop) represented the unhappy patients who were suffering because of the chaos resulting from the nurses' strike. In her fourth, in "Breathless", the nurses' strike is over, and the writers, clearly enjoying the character, have given Florence quite a few more lines. We get the first hint of depth to her character--she says she had a personal life once, before Mr. Hufnagel left her. 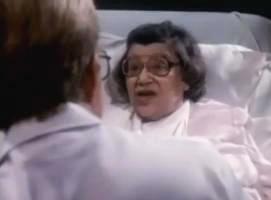 In this scene, Dr. Victor Ehrlich (Ed Begley, Jr.) drops in on his patient to examine her sprained wrist. He's in a sour mood due to his messy divorce. Mrs. Hufnagel, in an uncharacteristically friendly mood, inquires about what's distracting him. Victor tells her how his soon-to-be-ex-wife Roberta wants a portion of his future income, and as a surgeon, he'll be making a six-figure salary someday. Mrs. Hufnagel offers a counter-opinion to Victor's perception of his career prospects. I have a distinct childhood memory associated with this clip--at one point, Toronto's CFMT-TV 47 showed syndicated episodes of St. Elsewhere at something like 6 PM on weeknights (which seems really odd now), and the promo used a clip of the six-figure-salary-four-eyes exchange. It doesn't really surprise me that the show floundered in syndication. Syndicated shows ran in the afternoons/early evenings or late at night, and St. Elsewhere is not exactly family fare.